Nissan Motorsport will restructure its engineering department in the wake of the departure of tech guru Craig Spencer. While clearly regretting the exit of his engineering general manager, team co-owner, driver and technical director Todd Kelly said it coincided with the end of the heavy lifting on development for the team and a more concerted focus on racing consistently at the front. 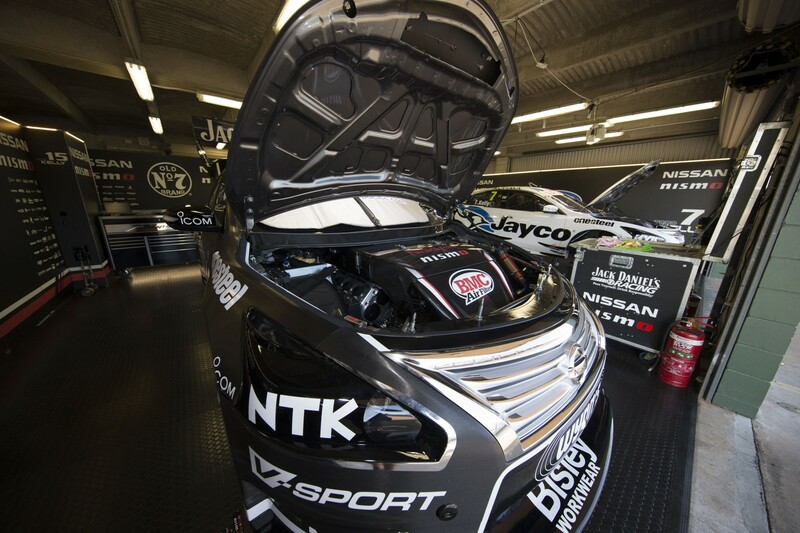 The team has made significant progress with the Nissan Altima in late 2015 with a series of podium and top five places following the introduction of a significant upgrade to the 5.0-litre version of the VK56DE engine the team has been developing since 2012. “Squiz (Spencer) will be missed, but at the same time with us having to focus a to harder on the racing side … it does give us a an opportunity to have a restructure and a rethink and a put a fresh approach into that, which I think will be good thing for the team,” Kelly said. “Everyone in the place will certainly miss him but we are well on the way to coming up with a good structure and scenario to take us through the next phase, which is good." Spencer joined Nissan Motorsport from the Mercedes-Benz Formula One team in late 2012. He also worked for several F1 teams as well as in motorbike racing before that. He is returning to European racing next year. But Spencer also had a nine-year stint in V8s, including with Rick Kelly as part of the all-conquering HSV Dealer Team of 2006-07. While unwilling to discuss the restructure in detail, Kelly did say Spencer’s job would be split in two. “That will enable us a little more flexibility and to focus on specific areas with the right people,” Kelly said. “He is pretty hard to replace old Squiz, so we have had to throw a couple of people at it in different ways. “Squiz has been a huge asset to the team and really instrumental in the whole engine development program,” said Kelly. “The workload we have had through this period has been astronomical and for a race team to take on something like that has been pretty ambitious as it’s turned out and wouldn’t have happened – or would have had a lot more serious impact on the racing – if he wasn’t part of the team. “The detail and the amount of work he put in was incredible. From the day he walked in our door he had the blinkers on and was just into it early morning and late nights. I never saw him not here basically, just hooking into it. Kelly said the 2016 season would bring with it an expectation of consistent top five results for the team. But he stressed that would require more performance not only from the cars but a lift in performance from the team as a whole. “We are more focused one refining the cars now, but it’s not just about the cars. The way we have been structured in order to do as much development as we have has been a little bit disjointed. “We have had to put way too much emphasis in specific areas and a lot of the other general areas have probably missed out a little bit. So now we have the basic package pretty good, it’s all those little things that are going to count for next year if we are going to get the most out of what we have got. “A lot of the car stuff, the debriefing and the engineering has to take a step up and we need to get a little bit of momentum and get used to driving and running our strategies in a completely different window in the top five and not the 10th to 20th window. Meanwhile, Kelly described his trip with V8 Supercars Sporting and Technical Director David Stuart to Nismo in Japan before the Coates Hire Sydney 500 as a good learning exercise for all parties as the introduction of the Gen2 technical regulations looms in 2017. “It was a relationship building exercise as much as anything,” said Kelly. “I haven't been over there since 2012 and we have done huge amount of work over the interim with those guys. "So it was good to meet them face-to-face and go through where we are with the current engine and chew the fat on potential options for the future.